The Boston Bruins will be without Sean Kuraly for approximately four weeks after the 26-year-old center underwent successful surgery to repair a fracture in his right hand that he sustained on March 21. Kuraly would leave the Bruins 5-1 victory against the New Jersey Devils after suffering the injury. The Bruins also announced that they would be recalling Karson Kuhlman from the Providence Bruins on an emergency basis. Kuhlman is in his first professional season with the Bruins after signing a two-year contract with the team in April 2018. He’s played in five games with the Bruins at the NHL level this season, scoring a goal and an assist and playing up and down the lineup. He’s also scored 12 goals and 30 points in 58 games in the AHL this season. The Bruins have dealt with a number of injuries over the last two seasons that have taken out star players, depth players and everybody in between. Kuraly is the latest casualty of this unfortunate streak of bad luck for the Bruins and could be at risk of missing the entire first round of the playoffs as a result of this injury. It’s an unfortunate end to the 2018-19 regular season for Kuraly who is in his second full season with the Bruins after playing in 75 games last season and eight games with the team in 2016-17. Kuraly has had a career year and has scored eight goals and 21 points in 71 games this season while being visibly electric over the last few months. He’s also coming off perhaps his best game as a pro when the Bruins beat the New York Islanders 5-0 on Tuesday. Kuraly was everywhere on the ice, opened the scoring just 1:12 into the game and recorded his second goal of the game in the second period. For the Bruins, this is just another obstacle to overcome. The team has done it throughout the season and sits in second place in the entire NHL despite these numerous, compounding injuries. With Kuraly added to the shelf, the Bruins are now without Torey Krug, Matt Grzelcyk, Kevan Miller (half of their regular defensive unit), Marcus Johansson (their trade-deadline addition who was playing in the Bruins top-six prior to his injury) and now Kuraly who was centering the team’s third line prior to this injury. They recently got both David Pastrnak and Jake DeBrusk back from injury. This news comes just minutes after the Bruins announced that they had re-signed Zdeno Chara to a one-year contract extension worth $2 million. The deal also carries performance bonuses that could boost his contract by up to $1.75 million. 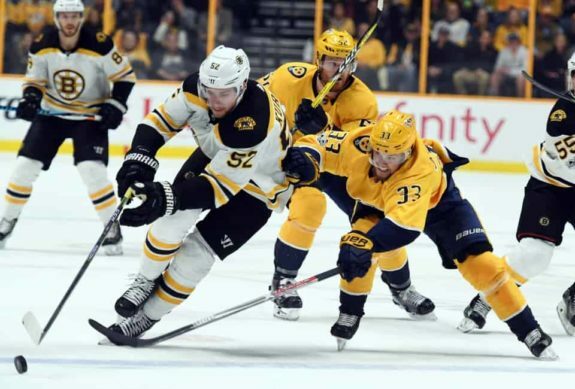 It’s been a roller-coaster of a day for the Bruins who will have to look ahead and continue working as a cohesive unit as they’ve done all season long as they enter their most important stretch of the season.